Considered to be one of Hollywood’s most iconic actors, John Travolta has graced the silver screen over the last 40 years with his memorable performances that have defined a generation. Whether it’s a Baltimore Housewife, disco king, or gangster, no one can forget his performances in Saturday Night Fever, Pulp Fiction, Face Off, Grease, or Hairspray. 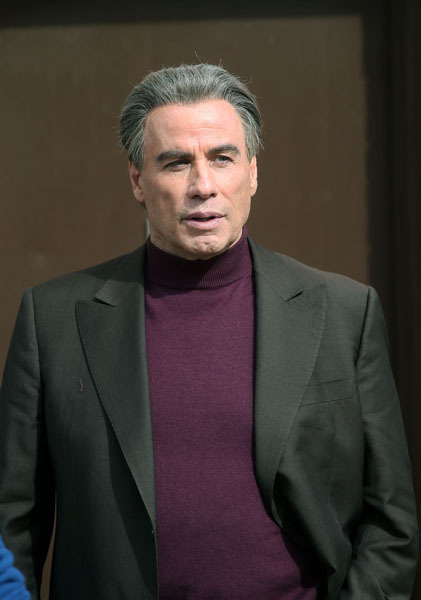 At the 71st Cannes Film Festival, Travolta not only celebrated the 40th anniversary of Grease but he also received the Variety Magazine Icon Achievement Award during the premiere his latest biopic film Gotti, in which he was the executive producer and lead. Here he got to play a married couple with his real life wife Kelly Preston. 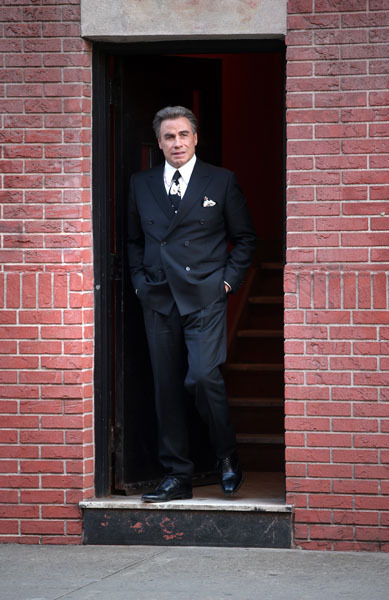 Resident Magazine sits down with the legendary John Travolta to discuss what it was like to portray one of the most famous mob personality in modern history, secrets to a successful Hollywood marriage, and what it means to be recognized as an icon. Do you remember meeting Kelly? It was at a screen test and I had 2 big dogs with me and it was at a time when she was beginning to get popular so I was familiar with her but didn’t know her. We had an immediate chemistry but she was married at the time. As she was going down the steps I remember asking her, ‘What’s it like to be married?’ I didn’t know I was 37 and a late bloomer. She said, “Oh I love it.” No one says they love being married, and I thought wouldn’t it be great to be married to someone who loves being married? That was the first connection, beyond the obvious admiration, as so few people like the idea. How is this Cannes festival for you as far as getting the Variety Magazine Icon award and premiering Gotti? It’s a remarkable surprise. I had a secret instinct that the Cannes officials would like the movie, so I encouraged them to submit it a while ago but it wasn’t ready. When it was finally ready I wanted to submit it. I had been here for 4-5 times already and I was right, they liked it and wanted to make it even more of a special visit. That’s when they came up with the idea. We like the idea of human movies rather than just comic strip movies. This is a tiny movie that wants to get recognized. Do you wake up every morning and think, ‘I’m an Icon’? The idea of being an icon is so simple, whether it’s Marilyn Monroe or James Dean or me. It’s not an egocentric thing, we are just super famous for something people visually recognize us for. I can’t help that the white suit or the leather jacket in Grease made me famous, or Marilyn Monroe’s white dress. It’s just part of the illusion. I like to take the egocentric part of it out. Have you ever had any doubts about your career? It’s an interesting question because I think I’ve achieved even more than I anticipated. I was feeling lucky about what I had achieved and I could’ve moved into a feeling of despair or insecurity because I had already achieved what I expected. My manager had expected it, I was just hoping he was right. There was always moments of doubt, what part of being an actor is ever certain. Part of the job is the mystery of what will happen next, but it’s also the excitement. So embrace it rather than think you will find some envelope of security. Nobody has any absolute security. There’s nothing to really anchor you. So I am an eternal optimist. I always see the glass as half full. Although life tries to knock it out of you and make you cynical I have never been part of that cynicism. Though I have played cynical characters I am not personally capable of that cynicism. Were there any roles that you regretted turning down? There are only a couple of roles that I think I could’ve taken that would have made my career transition smoother. Splash was written for me, as well as Officer and a Gentleman, Days of Heaven and Pretty Woman. There are films I could have done that would have transitioned my career. But overall I’m happy with the films I have chosen. So I don’t know if I had done those if I would be where I am today. I like very much that my roles have aged where I can choose the characters and roles that I like. That’s more interesting to me than having a perfect arc to a career. You are originally from Englewood, NJ and now you are playing a character from the same neighborhood. Does it seem like you are coming full circle? It does. Welcome Back Kotter, Saturday Night Fever, and even Get Shorty had New York characters that you can do a take on. 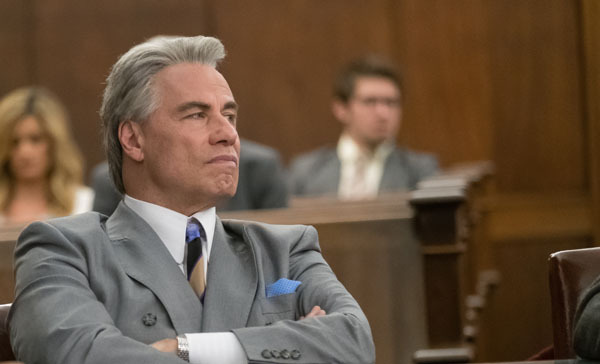 But I think the Gotti character was a very different character in his thinking, cadence, voice quality, behavior and physical movements. He was gruff but at the same time a genius. He instinctively knew business better than anyone and was the most powerful person in New York. So there had to be a smartness about him. I build characters like a recipe. I love adding things- accents, walks, style, behavior, cadence of vocal quality. I just look for fun in my characters. Even with the Shapiro character, I knew people like him. I’ve never seen that type of guy on screen before, but I’ve seen studio heads, producers, directors who had that kind of elitist thing they were vested in. They were high on a mountain but it was fragile. What was this like to play a married couple on screen and how different were they from you? Kelly always wanted to play a New Yorker and she hadn’t done that. When we chose this project we asked ourselves if we were really suited to play those characters. It gets criticized if it gets miscast. If you give integrity to the casting then it’s less attackable when there’s authenticity to the product. The only thing that was similar between the Gotti family and ours was that we both really adore our families to the level of an immeasurable value. They were obsessed with their wellbeing, but their style of living and their values were fun and interesting to play. They live in a neck of the woods where people are comfortable going at each other until their issue is solved. We try our best to use logic. This couple fought it out and then solved it. Was it fun using that vernacular with your real life spouse? Yes because I don’t think Kelly and I have ever cursed at each other. They were pretty rough with each other verbally. But there’s also a great humor watching them because these are funny people. There’s an innate humor between them. Where is the passion behind this project? Initially it was offered to me with a high budget and other expensive actors. But the financing dipped and I think we did really well with what we had. 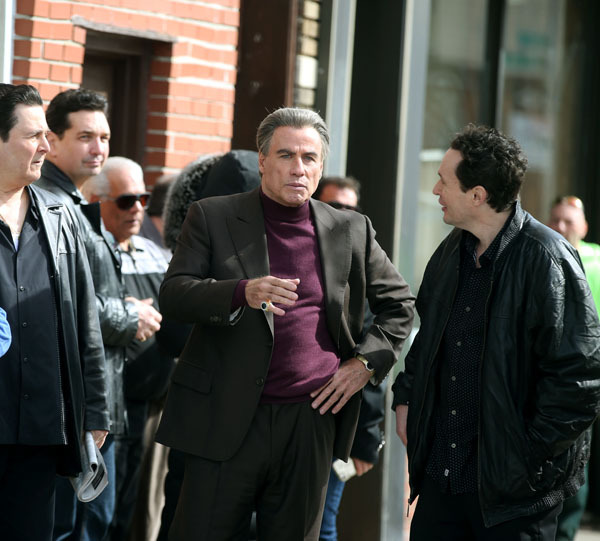 I think Gotti is the only modern criminal that I think is famous and an icon. There’s been no real ultra famous and loved gangster. 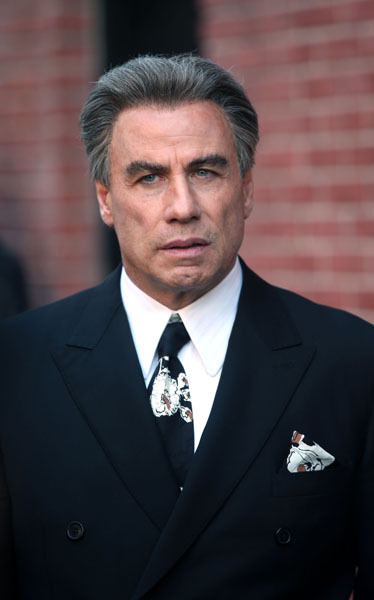 Gotti really was glamorous and he was a composite or a dichotomy of other people that was very intriguing, because he had a lot of style, was down to earth and could adjust to anyone he was talking to. He was thoughtful and considerate to everyone he talked to but he was also tough as nails, so all of that intrigued me. So how do I resolve that because I’ve never played that kind of character with those kinds of complexities. I really like those kinds of challenges. He had a kind of swagger and a style that was different so there were many ways to achieve this. 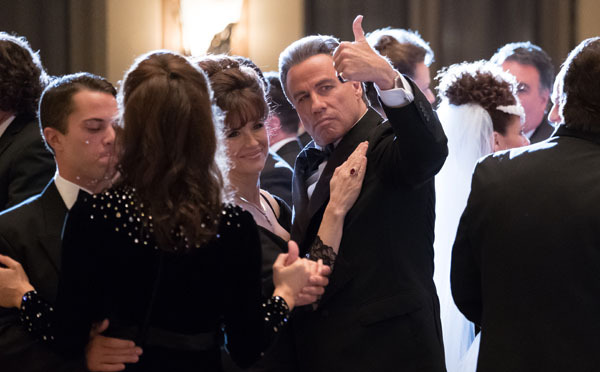 Did you enjoy meeting the Gotti family? I loved them, they were hilarious and articulate. John Jr. was a revelation. He was lovely and smart as a whip, was really super aware and ‘there.’ I was really impressed with him. He stood up to his father because he didn’t want that life and he wanted to protect his family. It took a lot of guts. In the film, John is in prison reflecting back on his lifetime and he’s really trying to talk his son into staying and running the mob but his son is very persistent on why he doesn’t want this. He finally acquiesces and gives the blessing to his son. The director was very uncomfortable with the death scene, what was involved with that? I have this ability to become another person. John had stage 4 cancer and was in another state of mind and I just became that and only entertained what he was thinking. I can become that person who is detached from themselves. My mother was an acting teacher. She always believed that acting was being and pretending so I’ve always been able to not suffer the pain that actor is experiencing but just becoming and portraying it. What was your favorite role to portray? I don’t really have one because I’ve done over 70 roles. It’s hard to pick one that I like the best. I just enjoy the adventure, I’m an existentialist in that way. The role I’m doing at the moment is the most important and interesting one. I don’t cross collateralize my roles. Are there any roles that you would dream of doing? I always say it’s the writer or journalist and I’m their muse, I will do whatever you come up with. I’ve always had a good rapport with writers, because if they have defined a character well I will help them portray that as well as I can. I would never have imagined playing half the roles that I did, it was always in the writer’s imagination. I loved adapting to their thoughts and if I can do it better than what they imagined I’ve done my job. What kind of life advice have you given your kids? My parents were loving and I had a wonderful childhood but they never taught me about cynicism. They didn’t tell me about the dark side of life or about people not to trust. I think that I would never want to spoil their optimism but instead protect it by telling them that there are people that can hurt you but be smart about who you choose to be in your life. Not everyone is worthwhile to be in your surroundings, maybe they are not healthy for you. When you trust everyone, you can get knocked down and while it doesn’t ruin you as a person it can be highly disappointing.